Recently I discovered this favourite of mine, the NAC Cosmetics Super Flawless Foundation. Been using it since I got it especially night time when I just chill at home and still wanna look cute. Yep, still taking an effort to look cute in front of my husband haha! Wanna know why? I love the fact that this foundation feels like my skin but better. It has a matte comfortable finish and does not look like I wore heavy makeup like I used to when going out. Just pretty cute and natural for everyday at home. I will let you know more about this foundation as below. NAC Cosmetics Super Flawless Foundation comes in a super chick looking packaging. Black & Pink can never go wrong. Each bottle contains 15ml of product and comes in this sturdy gold pump tube. This foundation is Paraben Free. It has a Salmon extracts which help in anti aging. It also has Beeswax extracts that help to protect your skin from bacteria and has anti-acne properties. Perfect for the day, it also comes with SPF35 to protect your skin from dangerous sunlight. Contains Vitamin E & C to help reduce spots/damage on your skin. It stays for 12 hours but it is wudhu friendly. Which means easy to remove for you to take your wudhu properly. You can refer to this video to find out more about the wudhu friendly term. It feels lightweight and smells good! Smells like berries t me. It is formulated with Korea Advance Technology formulation. The texture of this foundation is pretty creamy. I prefer to use my finger to blend it into my skin. The warmth of my hands melts the foundation nicely onto my skin. The coverage is sheer to medium, after a few minutes, it settles down to my natural skin tone but a bit fairer. NAC Cosmetics Super Flawless Foundation is wudhu friendly (easy to remove) and has treatment benefits while wearing it. It may come in one one shade but as you apply it, it will match the natural skin tone of your skin base on your blood color. It does not give me that too much of a white cast effect. Also as you can see from the before & after picture above, my pores look visible and my skin looks smoother. It looks really natural and gives my skin a healthy glow looking skin. 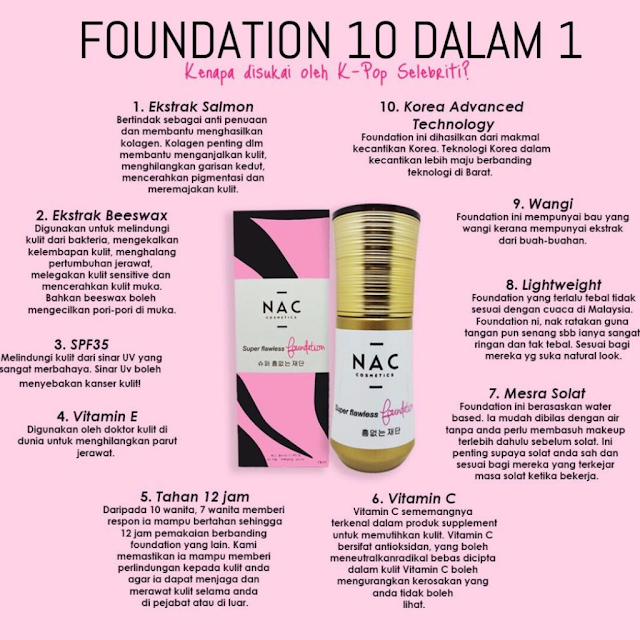 This NAC Cosmetics Super Flawless Foundation is imported from Korea but has local Malaysia KKM & Halal certificate. Salam sis, ya betul makeup sambil merawat kulit wajah. Paling penting wudhu friendly.